I know you heard me complaining before about how Owen has been hating baths lately, well his tune has not changed and I think we may have to regress back to baths in the sink. We just dread giving him baths, and I don’t want him to be that kid at daycare, you know the stinky one :/. Our sink is a good size, and I think he can still fit in it. Maybe with it being a smaller area he might be ok with it. Fingers crossed. It is just so weird to me that he loves playing with the water on the water table, but refuses to sit down in the tub or a baby pool. 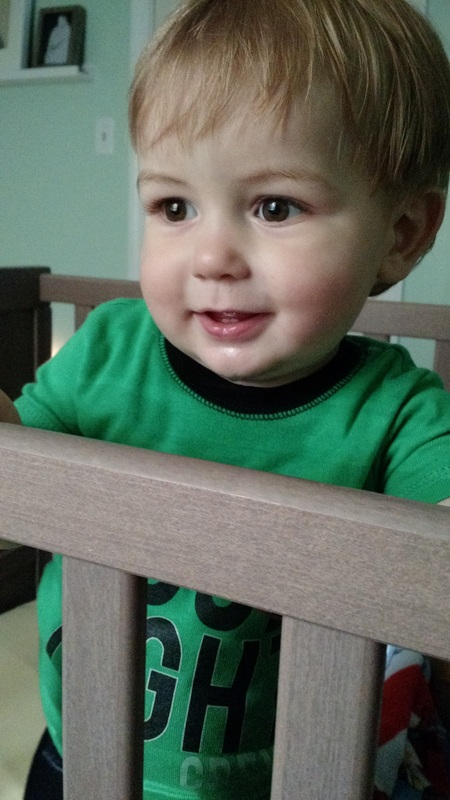 We’ve been doing a lot of crib gymnastics/crawling very quietly out of his room this week. I call it crib gymnastics when Owen falls asleep while I am rocking him and I need to somehow lift him up and set him back down without waking him. He isn’t light so this can be challenging. Whatever it takes for him to sleep. I’ve noticed that he has been talking to himself a lot more in the mornings and before he falls asleep. Mind you, I can’t understand what he is saying but it’s kind of cute. 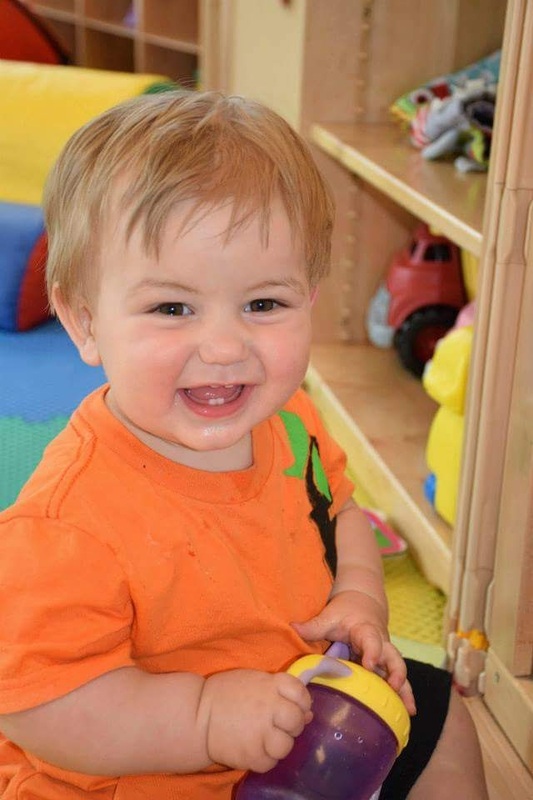 He did learn how to say “no” last week and he has been making “buzz” and “moo” sounds. 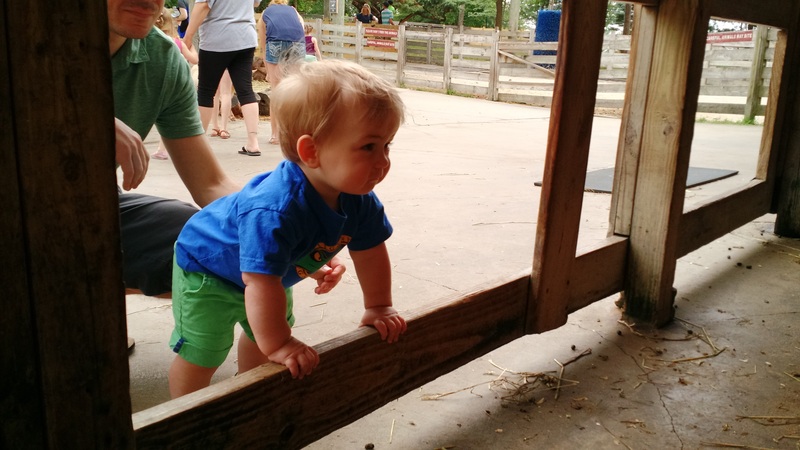 He isn’t sure what animals the sounds belong to, but I am sure he’ll understand soon. Happy Belated Father’s Day to all the dads out there. 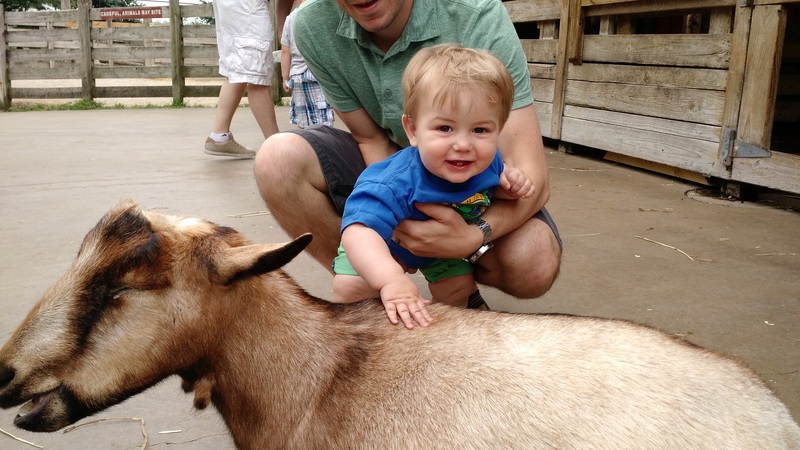 We had a nice quiet Father’s Day at home and took another trip to the zoo. I am sure the title of this post could be used for any parent at one point or another. It has really hit us this past week with Owen waking up multiple times a night due to a fever. I can’t blame him, but it hurts when the only thing that you can do is give him medicine and hope he can relax enough to fall to sleep. The doctor said that it could be Roseola because he never had any symptoms leading up to the fever. Thankfully the fever went away by Friday morning, and he slept through the night again last night. I blame the lack of sleep for the dropping of my phone and shattering the screen on Saturday :/. I think Owen really has a fear of sitting down in water. He still hates baths, and when we went to a friend’s house to try out their baby pool Owen would not go near it :/. I am hoping this might have been because he still wasn’t feeling well and that he get over it soon. I really want him to be able to enjoy playing in the water since the Summer season is so short. One adorable thing that Owen did on Sunday while he was playing in the water table was take my hand and have me make waves like he was doing. It was pretty cute and made me forget for a moment just how crazy the week had been :). Last week the cabinet locks were put on and we are still not used to them. I hope they are strong because we both have yanked on them a bunch without remembering that we have them. I wonder if there will ever be a point when we will remember that they are there. Saturday was zoo day for us. We are lucky enough to live in a city that has a wonderful zoo. There’s so much to see that, with out zoo membership, I’m glad we can break it up into multiple trips without having to worry about additional entrance fees. 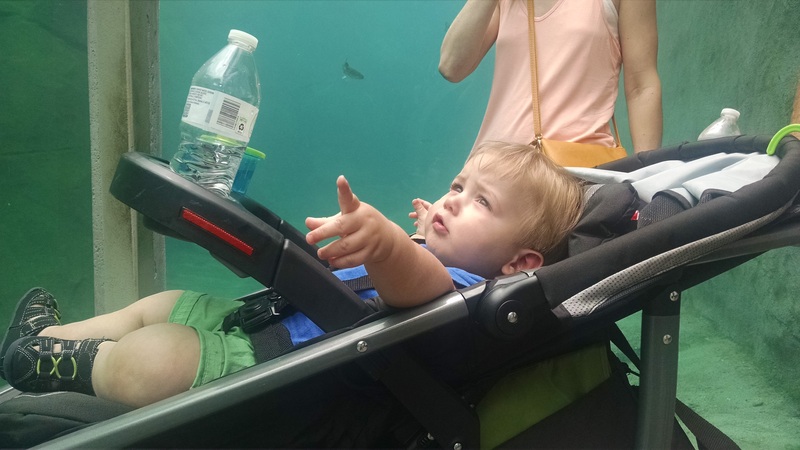 It was Owen’s first trip to the zoo, and he loved it! We stopped by the petting zoo first. In the petting zoo he was able to walk around with the animals and pet them as he got close – though his petting is more like a slap. So I guess we should probably work on that with him. He also loved watching the animals walk past him to get their lunch. At one point in the day Owen got a really good look at a brown bear. The bear was huge, and he walked right over to Owen and stared at him. Owen just stared back. 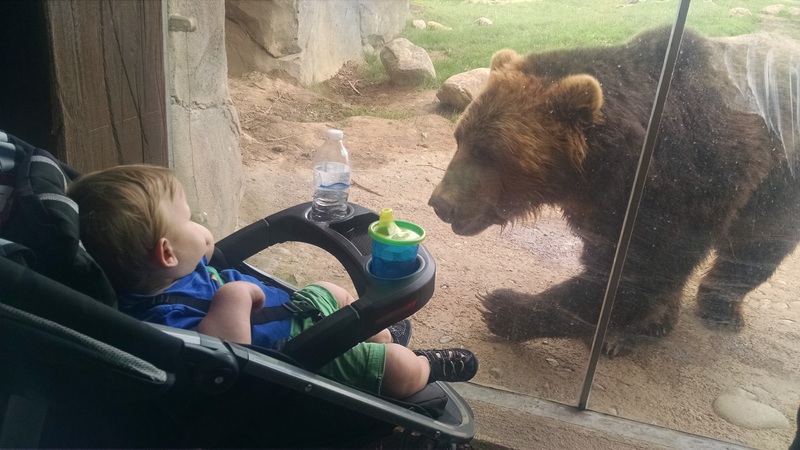 I know that there was a very strong and thick glass in between the bear and Owen, but it still freaked me out a little bit. He was just staring Owen down like he would be a good appetizer. Speaking of food, the one thing we should have done was pack a lunch. I am sure there are better places to eat, but we were starting to get hangry so we stopped at a random food vendor. It was expensive and kind of gross. Next time we go we will have to pack some food and find a nice shaded picnic table. For the past 3 weeks Owen has been really hating baths, and we don’t know why. Every time he gets into the bath tub we can’t seem to get him to sit down. So when we try to rinse his hair the water gets splashed outside of the tub. 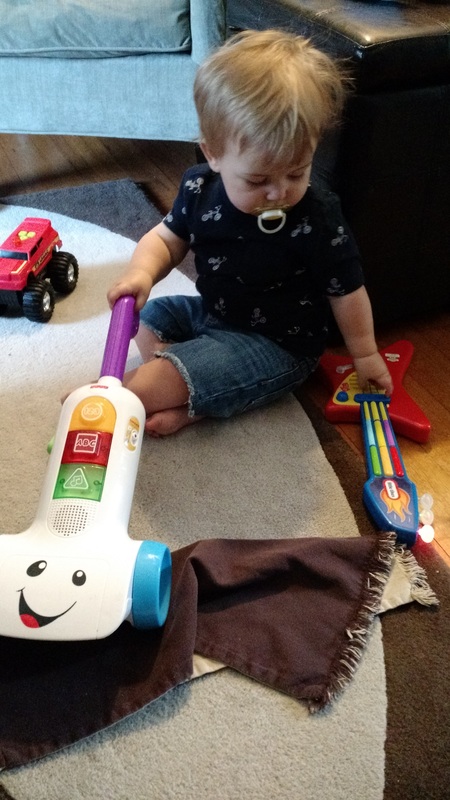 I know he likes playing with water because when we took the water table out this weekend he stood and played with the toys for a long while. Of course he was pretty much dumping the water out onto the ground, but it didn’t bother me or the driveway. He was happy and content. I’ve heard from other parents that parenting is always changing depending on the stage that your child is in. I’m happy to announce that Owen has entered a new stage and is now walking :). 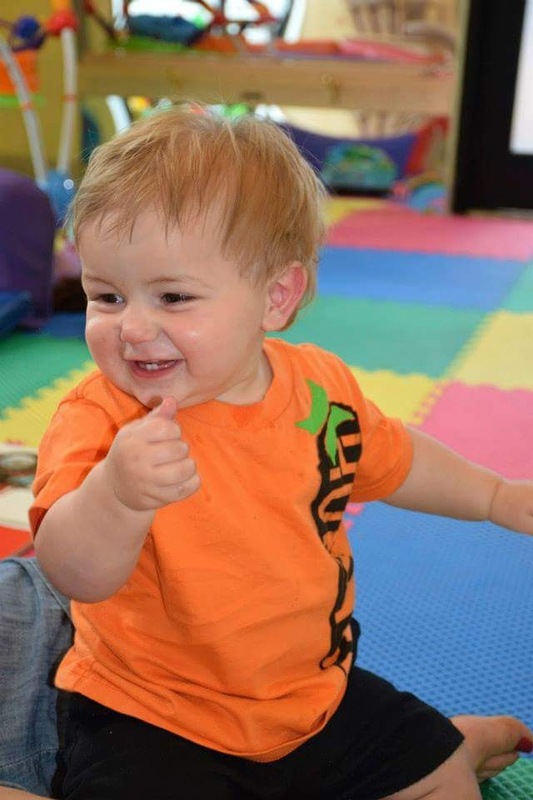 He took a few steps last week, but on Tuesday after daycare he walked from the car to the house – it was adorable. I love the look on his face when he walks to get to a toy or to another location. He is so proud of himself. With him being in this new stage he has been really getting into cabinets and other things. So we might want to finally install some of the cabinet locks that we’ve had stored away somewhere. I will try my best to no longer hover behind ready to catch him :/. Why can’t I just wrap him in bubble wrap? This past weekend was our first weekend away without Owen. I was a bit tense on Friday after we left him, but I felt better once we received a picture of him smiling. Being baby-free we were able to relieve some of our college days at Tony’s alma mater, Allegheny College, for their reunion weekend bicentennial celebration – we even stayed in one of the dorms. I can honestly tell you that I don’t miss sleeping in twin beds or having to wear shower shoes, yuck! However it was a lot of fun to hang out with some friends all weekend. I wish I would have taken some pictures, but the weekend away disappeared quickly. It seems that I really only think about taking pictures when Owen is around. 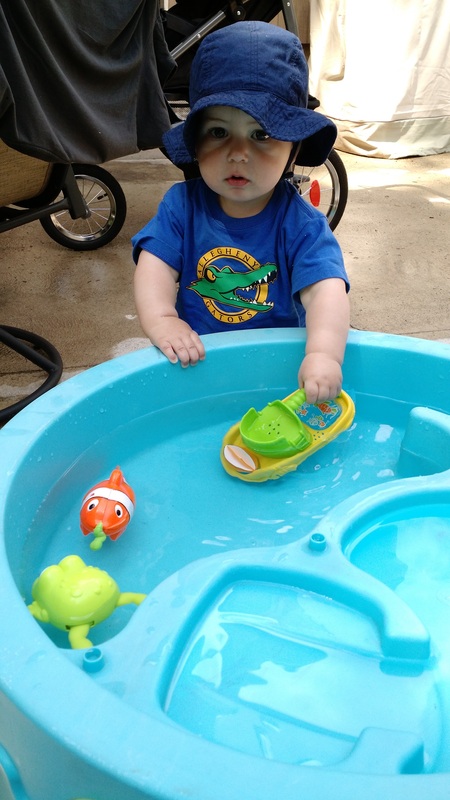 Now that the weather is warming up Owen’s daycare will be having water days every Wednesday. He has all of the essential attire other than water shoes. He does have sandals, but I want to make sure that he has a separate pair of water shoes so he doesn’t have to walk around with wet feet all afternoon. Anyone have ones that they would recommend? I saw some Croc-type ones on Amazon that might work. They seem to be the only ones that came in his size. 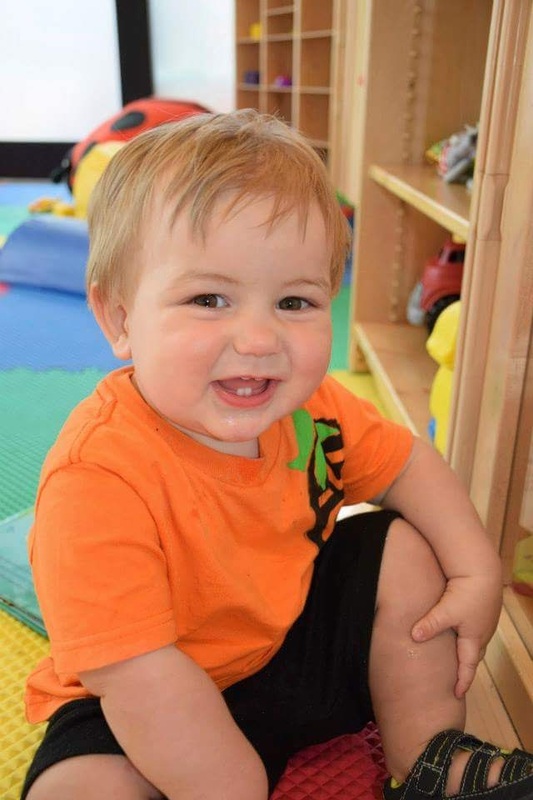 Every once in a while Owen gets in a picture at daycare and this past week there are some really great ones. Here they are :). 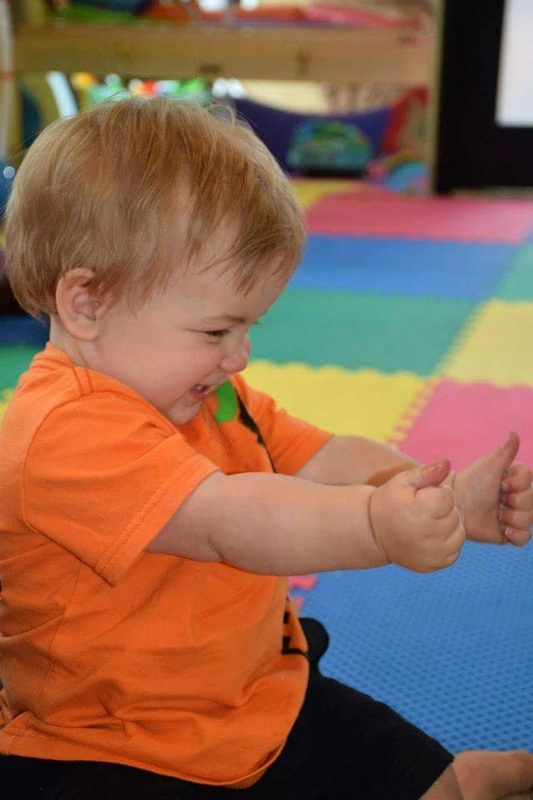 You can tell that he really enjoys daycare.